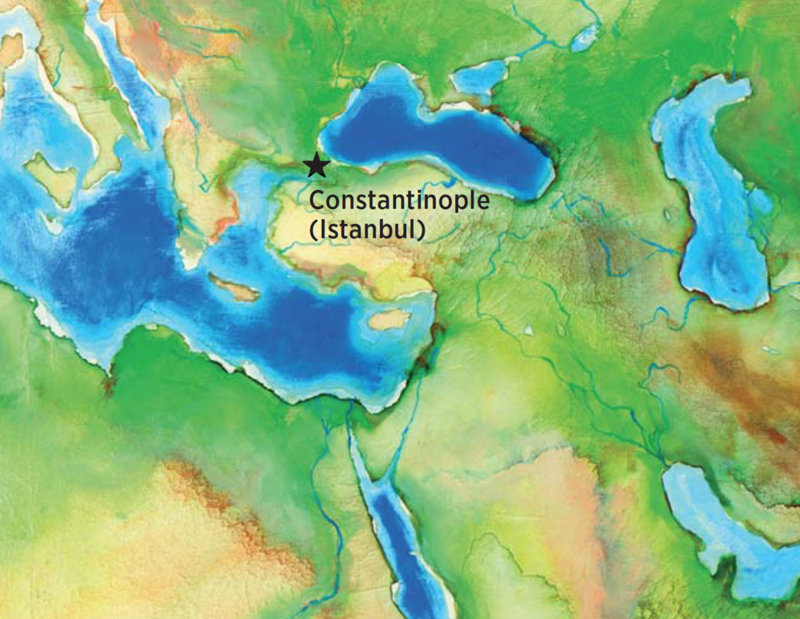 Our fourth story comes from the capital of the Ottoman Empire, Constantinople. The reign of Ottoman Sultan Suleiman I ("the Magnificent"), from 1520 to 1566, was the empire's golden age. Equally impressive was the century and a half that followed, the Kadinlar Saltanati, or the "Sultanate of Women." During this era, a succession of politically savvy royal women directed much of the government's affairs, often as regents for underage male sultans. First among them was a woman who came to the palace as a slave and eventually played a role in foreign and domestic affairs and served as an intimate political advisor to the sultan. Europeans knew her as Roxolana, meaning "a girl from Roxolania," the medieval Latin name for Ukraine. Her Ottoman name was Haseki Hürrem Sultan, from haseki (favored wife or royal consort) and hürrem, meaning "joyful" or "laughing one." According to legend, she was born Anastasia (or Aleksandra) Lisowska, around 1505 in western Ukraine. Abducted by Crimean slavers at age 15, she arrived in Constantinople (today's Istanbul) where she was supposedly purchased by Ibrahim Pasha as a gift for his boyhood friend and soon-to-be-sultan Suleiman. Others say Roxolana was assigned first to the royal laundry, where her skills as an embroiderer were matched only by her musicianship. As the story goes, Suleiman was passing by the laundry when he overheard her singing and playing Ukranian songs. Stumblingly conversant in Slavic, the sultan "stopped to talk with her in her outlandish speech," and was immediately smitten, as his 1951 biographer Harold Lamb recounted. While smacking of fairly tale, the story suggests it was Roxolana's wit and intelligence that made her stand out. Indeed, Venetian ambassador Pietro Bragadin described Roxolana as "young but not beautiful, although graceful and petite." Once Suleiman officially noticed Roxolana (laying a handkerchief across her shoulder was the court custom), she became the third most powerful woman in the palace after Suleiman's mother, Hafsa, the valide sultan, or "queen mother," and his qadin sultan, or first lady, Mahidevran, mother of Suleiman's eldest son, Mustafa. Clashes with mahidevran were swift in coming. By 1526 the Venetian ambassadors-meticulous observers of court politics and intrigues-had noted that Suleiman favored Roxolana. Envoy Bernardo Navagero wrote that Mahidevran confronted her, shouting, "Traitor, sold meat [i.e., "bought in the bazaar"]. You want to compete with me?" as she clawed Roxolana with her nails. Later summoned, Roxolana sent word to Suleiman that she was not presentable. Baffled, he demanded to see her. She "related to him what had happened ... showing her face, which still bore the scratches." Mahidevran confessed, adding brassily that "she had done less to [Roxolana] than she deserved." This "inflamed the sultan even more," and "all his love was given to the other"—Roxolana. "This week there has occurred in this city a most extraordinary event, one abolutely unprecedented in the history of the Sultans. The Grand Signior Suleiman has taken to himself as his Empress a slave-woman from Russia." The episode underscores Roxolana's talent for navigating palace politics. Although not an official qadin-a title that would remain with Mahidevran as mother of Mustafa-as Suleiman's favorite it was soon apparent that Roxolana was done playing by old rules, with Suleiman's blessing. She started by defying the harem's century-old "one mother-one son" policy, preventing a royal consort from bearing more than one heir. Between 1521 and 1531, whe had a son, Mehmed; a daughter, Mihrimah; and then four more sons: Abdullah, Selim, Bayezid and Cihangir. In 1541 she defied another royal tradition by remaining in Constantinople rather than accompanying Mehmed to his first administrative post in the provinces. (Normally, only upon the sultan's death would the mother of the eldest male heir be permitted to return to the capital, where she would then assume the role of valide sultan.) She shattered another, far greater tradition by becoming the sultan's wife. "This week there has occurred in this city a most extraordinary event, one absolutely unprecedented in the history of the Sultans," remarked one Genoese ambassador in an undated letter. "The Grand Signior Suleiman has taken to himself as his Empress a slave-woman from Russia, called Roxolana [sic], and there has been great feasting." The wedding, in 1533 or 1534, was Suleiman's most public declaration that he was "deeply devoted" to Roxolana, wrote historian Leslie Pierce. As the Venetian Navagero observed: "There has never been a woman in the Ottoman palace who had more power than she." The royal couple's correspondence highlights their passion. "[M]y bright moon ... my elixir of Paradise, my Eden/I am a flatterer near your door, I'll sing your praises always/I, lover of the tormented heart, Muhibbi of the eyes full of tears, I am happy." "I wish for your success," Roxolana wrote to Suleiman when he was off campaign in. "However my greatest wish is to be reunited with you. You are the only cure for my grieving, sorrowful heart." Suleiman was equally smitten. Under the alias Muhibbi (The Affectionate One), he replied: "[M]y bright moon ... my elixir of Paradise, my Eden/I am a flatterer near your door, I'll sing your praises always/I, lover of the tormented heart, Muhibbi of the eyes full of tears, I am happy." Suleiman' devotion was both sentimental and singular. He refused "to know any other women: something that had never been done by any of his predecessors," wrote Domenico Trevisano, another Venetian envoy, in 1544. Nevertheless, Roxolana eliminated potential rivals by persuading Suleiman to marry off the prettiest of the young women in the harem. She also (happily, no doubt) waved goodbye to Mahidevran in 1533, when the qadin followed Mustafa to his ﬁrst ofﬁcial, provincial appointment. A year later, Hafsa died, leaving Roxolana mistress of the harem, at least pro tempore, as Mahidevran remained rightfully next in line to become valide sultan. But another rival remained: Ibrahim, now grand vizier. Though one of Suleiman’s closest conﬁdants, Ibrahim developed his own aspirations to the throne. After a decade or so of honors, wealth and ever-increasing authority, Ibrahim grew arrogant and “was much hated,” ambassador Bragadin wrote. Ibrahim ran his own military campaigns and even referred to himself as “sultan” in negotiations. His fall was swift: On March 15, 1536, servants found him with his throat cut. While Suleiman ordered the execution, Roxolana was rumored as its architect. To historians, this remains “a matter of conjecture,” wrote Galina Yermolenko, author of Roxolana in European Literature, History and Culture, and yet Roxolana “might have exploited the rumors against Ibrahim and inﬂuenced Suleiman’s decision.” As early as 1526, Pierce noted, Roxolana informed Suleiman of tensions with Ibrahim and lost little time securing the newly vacant post for Rustem, husband of her daughter, Mihrimah. In 1541 a ﬁre in the Old Palace inched her closer to the pinnacle of power. Located in the center of the city, the Old Palace was the ofﬁcial residence for both the sultan and the harem. The newer Topkapı Palace, on a promontory over-looking the Bosporus, served as seat of the court. After the ﬁre, Roxolana convinced Suleiman to relocate the harem to Topkapı. The move permitted her to be at Suleiman’s side constantly, where she could advise him more closely on political matters. Writing to him while he was away, she informed him of plagues infesting the city and warned him of potential unrest. She also corresponded with the king of Poland regarding the suppression of the Crimean slave trade—a subject of doubtless personal interest. Wits and devotion led to her power and precedent. Mustafa was the “envy of all the princes,” as one Ottoman historian described him, beloved by the people and the army—a bit too beloved, it seemed. By 1553 rumors of Mustafa’s plans to usurp his father reached Suleiman’s ear, driven primarily (according to court gossip) by Rustem and Mihrimah who in turn may have been egged on by Roxolana. Suleiman reportedly watched from behind a curtain while Mustafa was strangled with a silken cord. The dramatic downfalls of Roxolana’s rivals, the tectonic shifts in government policies she seemed to inspire—plus Suleiman’s unwavering devotion—all fueled inevitable jealousies, suspicions and rumors. “[T]he entire court hate[s] her and her children likewise, but because the Grand Turk loves her very much, no one dares to speak,” wrote Venetian courtier Luigi Bassano, adding that Suleiman’s subjects attributed Roxolana’s power over him to magic, calling her ziadi (witch). While rational critics have since ruled this out, most early modern historians continued to portray Roxolana as a ruthless schemer. More recent scholars say this may be unfair. Despite her detractors, Roxolana held her head high and carried on with her royal duties. She established waqfs (charitable endowments) and endorsed grand-scale building projects. Her largesse included a development by the new royal architect Sinan that included a mosque, two madrasas (Qur’anic schools), a soup kitchen, a hospital (still in use to-day as a women’s medical center) and an elementary school—all in Istanbul’s Avrat Pazari district, site of the women’s slave market where she herself had once been sold. Here again Roxolana broke precedent. In the past, endowments of concubine mothers were limited to provincial cities, “while the sultan alone was responsible for the most splendid projects in the capital of Istanbul,” noted Pierce. Roxolana died of an unknown disease on April 18, 1558. Even in death, she deﬁed protocol: adjacent to the newly built Suleymaniye mosque, her tomb was erected beside the place set for her husband, making her “the ﬁrst woman in Ottoman harem history to have been honored in that way,” wrote Yermolenko. Suleiman lived eight more years. Roxolana’s second son, Selim, succeeded him, Mehmed having died as a young man. Yet while he and subsequent male rulers often stumbled, Roxolana established an environment where women ably took their places. They included Selim’s wife, Nurbanu, as well as regents Kosem and Turhan, who ruled during the late 17th century. These and other such women stood upon the slight yet steadfast shoulders of the queen who proved she was strong enough, in character, to bear the weight of an empire. Art direction for the “Malika” series is by Ana Carreño Leyva. Calligraphy is by Soraya Syed. The logo graphics are produced by Mukhtar Sanders (www.inspiraldesign.com).